GoalBit is not just another video platform. It is innovation, a community, a P2P video distribution protocol, an open-source Media Player and Broadcaster, an infrastructure to help Academic researchers and much more! We have a close relationship with Academic´s multimedia research and innovation groups. It helps us to be in line with most innovative tendencies and with the global guru´s of multimedia. And we can do it without the cost of a large company. Our products and development have a very solid academic support. Several publications validate our contribution (more than 25 research papers published, and more than 50 researchers was involved in the last 5 years). It ensures an up-to-date video solution, and a simple way to cover the future needs of our customers. Our investigation is/was partially supported by INRIA and UDELAR. To be up-to-date in video technology is indispensable for a video platform. As fast as possible, we integrate to our products the open source software and the community knowledge. Every day we work with ffmpeg, x264, gstreamer, videolan projects, etc. If you have these particular needs, we can help you a lot because we have been working on these technologies for a long time! Also, we made an important contribution to the open source community. Our open-source project has more than 220.000 downloads, with an average SourceForge project rank of 200 (from more than 300.000 other open-source projects). 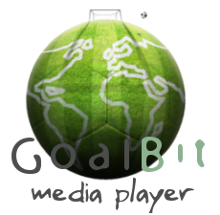 With the Goalbit Media Player (desktop and browser plug-in editions) you can play and record video streams from the web, and you can live broadcast yourself with a home Internet connection. 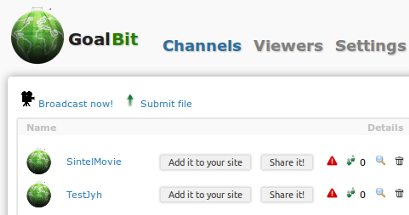 Also, you will need the Starter Suite in order to distribute GoalBit channels in the Web, and in order to do a web broadcast from the GoalBit Media Player browser plug-in. Important: these products were design for home and academic research. If you want to deploy a commercial service please move forward to our Goalbit Play solution now!